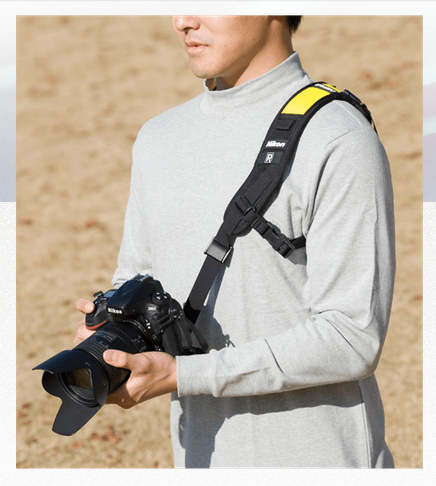 Nikon teams up with Black Rapid to offer a new quick draw camera strap. The Quick-Draw Strap and Quick-Draw Strap S were developed based on quick-draw straps invented by photographer and BlackRapid founder, Ron Henry, and popular throughout the market for their incredible convenience. The straps have been further refined to offer even greater convenience. Along with the great mobility offered by BlackRapid products through specifications that enable on-the-go shooting with a mechanism that allows the camera to slide diagonally up and down the shoulder strap, a system that utilizes the camera’s tripod socket so that the camera hangs upside down for a smooth grip, a shoulder pad that effectively distributes weight for less burden, and an under-arm tether that holds the strap firmly in place, these two new straps offer an even greater sense of security with a safety strap that prevents the camera from falling in the unlikely event the fastener comes loose, and a cover that prevents the carabiner that connects the strap to the camera from scratching the camera body. 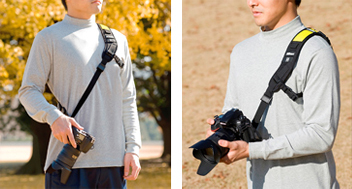 The Quick-Draw Strap, with a wider shoulder pad, is suited to use with digital SLR cameras. 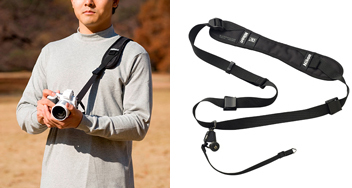 The Quick-Draw Strap S, with a narrower shoulder pad, is suited to use with Nikon 1 advanced cameras with interchangeable lenses and Nikon COOLPIX compact digital cameras.